The forecast by Na Draki Weather yesterday said the tropical disturbance would pass over the North East corner of Fiji before it moves Southward to the East of the Lau Islands. It is also forecasted to recurve Southwest passing through the Central and Southern Lau group then South of Kadavu. Latest satellite image from Fiji Meteorological Office on 3pm 11th February 2019. A new tropical disturbance has developed on Saturday night over waters to the north of Udu Point. The forecast by Na Draki Weather yesterday said the tropical disturbance would pass over the North East corner of Fiji before it moves Southward to the East of the Lau Islands. It is also forecasted to recurve Southwest passing through the Central and Southern Lau group then South of Kadavu. 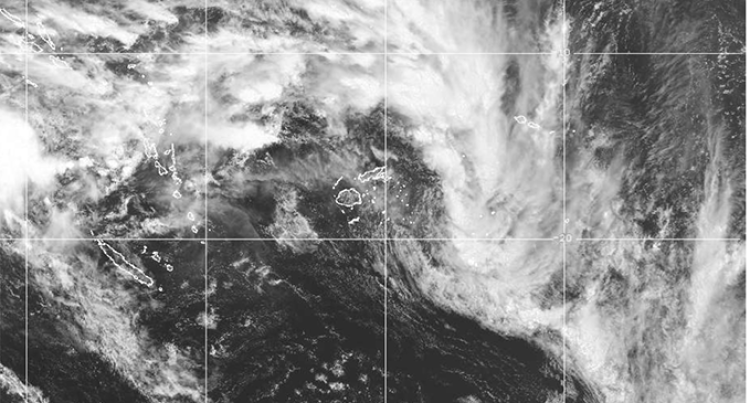 Na Draki said the system was likely to have a greater influence on the weather for Fiji this week. However, in the near term there is no significant hazard. Hot and steamy with mostly sunny skies through the middle part of the day. Skies hazy with patches of high clouds from time to time. Cloudy, increasing later in the day with one or two showers possible, more likely on the higher elevations inland. Light to moderate southeast winds and fresh daytime sea breezes about the mainland. More of the same with a humid but relatively settled day anticipated with a mix of sun and clouds. A few passing showers about the maritime islands and the windward coasts of the larger islands. More likely about the coast and inland hills of eastern Viti Levu and the Serua coast, and along the Hibiscus coast of Vanua Levu. Moderate south easterly winds tending fresh to strong over Lau waters and the Koro Sea with seas rough and high swells over Lomaiviti, and Lau affecting coastal communities.